What’s the difference between a Toner, Essence, Serum and Ampoule? Following double cleansing, toner is the third step in the Kbeauty routine. First and foremost, toners help balance the pH of skin. Skin’s optimal pH ranges from 4.5-6.2 and it can be thrown off by cleansing. While a low pH cleanser can help reduce this imbalance, even the water you use to rinse away residue can leave skin in a slightly alkaline state. A toner can help neutralize these effects and keep your skin from becoming too dry or oily after you wash your face. It also serves to remove those last traces of makeup you may have missed with your cleanser. Furthermore, while American toners have a notorious reputation for being dry and harsh, many Korean toners actually help soothe and kickstart hydration. Toners are so popular in Korea that hacks like the 7 Skin Method and Toner Wash Method are ultra popular ways to utilize toners to promote glowing skin. These lightweight liquids can also often provide a boost of antioxidants, soothing agents, and vital hydration. Essences are the heart of the Korean skincare routine, these liquids lend a major boost in moisture. Proper hydration is what gives skin that glowing, lit from within look. Additionally, having a healthy hydrated skin barrier prevents issues like irritation and allows your complexion to be radiant. Beyond hydration, many essences also contain antioxidants and minerals to help nourish skin. Think of toners and essences as the prep steps before the main treatment, your serum. Serums are likely the most well known product category as they’re quite common stateside, as well. 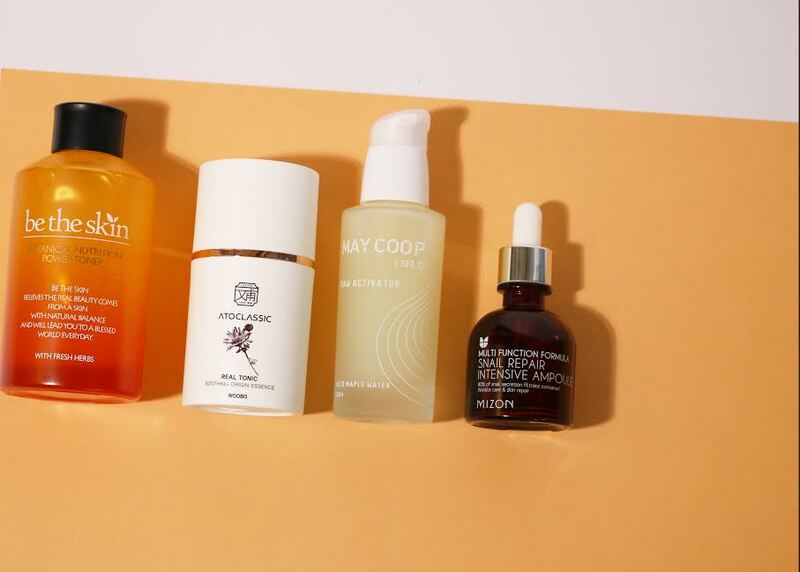 Serums tend to be more concentrated in its active ingredients, these emollient gel-like substances often feature heavy-hitting ingredients meant to really target and treat skin issues like dark spots, wrinkles and dullness. Usually, serums are thought to have a more viscous texture then essences. Ampoules are considered to be more concentrated version of a serum, think of it as a booster shot. They often contain a higher number of active ingredients and are used for a finite amount of time. For example, you may want to use a weekly ampoule pack so you can get big results before a big event or after a major skin crisis. You may often see them in smaller vials or dropper bottles as a little goes a long way here. As there’s no regulation on these terms, keep in mind that the texture can vary from brand to brand. A general rule of thumb is to apply essence, serums and ampoules in order from thinnest to thickest in texture. This allows for the best possible absorption.